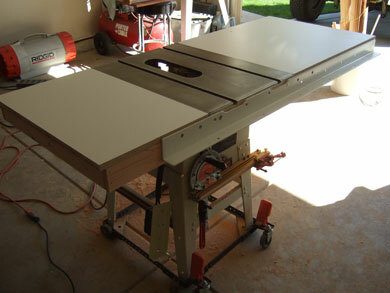 After installing the new Biesemeyer commercial fence, i wanted to dress up the table saw and give it more workable space. What better than to replace the weak steel wings with the flat and smooth melamine boards. Fist I needed to build a strong base for the boards to sit on. I went to home depot and bought some cheap douglus fir 2x4 studs. Cut them to the lenght I wanted (31" long and 25 1/2" wide - that is with the lap joints factored in), then ran it through the thickness planer to make them all the size size. Next I ripped both side of the 2x4 to get rid of the bevel edges. 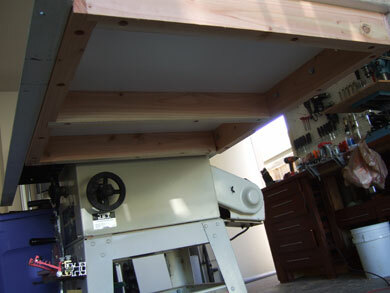 Finally I cut some lap joint on the ends and assembled everything. Here is how the table looks with the right and left wings replaced with melamine tops. 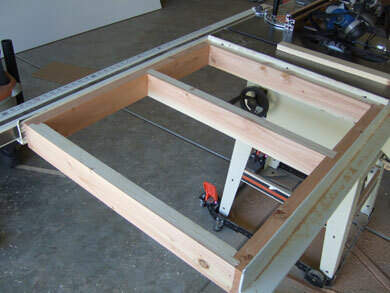 Next, i will cut a hole to drop in my router table.